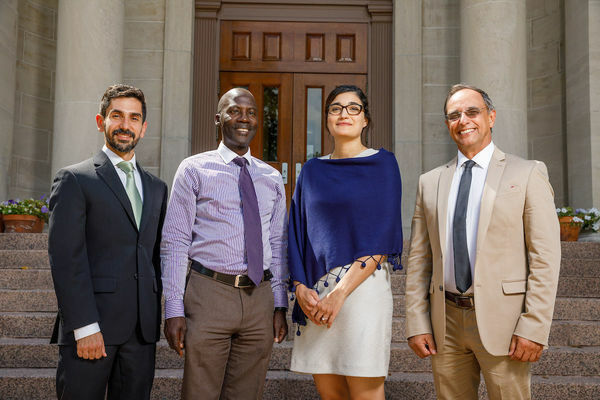 This fall the School of Architecture was pleased to welcome four new faculty members to the South Bend campus and one new visiting faculty to the Rome Studies Program. Professor Judith DiMaio is a licensed architect, renowned scholar, and educator whose work emphasizes the active, interdisciplinary collaboration of building design, technology, and history. She is Dean Emeritus for the School of Architecture and Design at New York Institute of Technology and was previously an associate professor at Yale’s School of Architecture and director of Yale College’s Architecture program. DiMaio has been a visiting professor and lecturer at colleges and universities including Columbia, Cornell, Rhode Island School of Design, Rice University, and the University of Chicago; an invited lecturer at Magdalen College, Oxford. Prof. DiMaio joins the school again after serving as academic director of the Rome Studies Program for four years. Professor Giuseppe Mazzone began his academic career as a student at The Polytechnic University of Bari in Bari, Italy. There he earned his bachelor and master degrees in Architecture before attending University of Wisconsin-Milwaukee to pursue doctoral studies. Prof. Mazzone specializes in traditional drawings and digital technologies and has used “life-sized 3D architectural and historical reconstructions in immersive, virtual-reality environments” in his doctoral research. Prof. Mazzone will use his expertise to help grow the School’s current digital technology offerings. Professor Julio Cesar Perez-Hernandez began his relationship with the School of Architecture in 2010 when he was invited to lecture on campus. Following his lecture, in 2011 and 2012, Prof. Perez-Hernandez assisted the School during studio travel in Havana, Cuba. He subsequently served as a Visiting Professor during the Fall Semester of 2012. Prof. Perez-Hernandez earned a bachelor’s degree at the School of Architecture of the University of Havana where he would go on to teach from 1988 to 2006. In 2001, he became a Loeb Fellow at Harvard University Graduate School of Design, where he was selected as the 2012-2013 Wilbur Marvin Visiting Scholar. He is the founding Principal and Creative Director of Caesar Studio | Architects & Planners, an international practice with a focus on excellence. Prof. Perez-Hernandez also serves as the President for the Cuban chapters of INTBAU and CEU. Originally published by Rosalyn Wells at architecture.nd.edu on November 01, 2017.